The MP Rotator nozzle by Hunter is a revolutionary enhancement in lawn irrigation; helping homeowners like you achieve healthier landscape growth while reducing water usage by up to 30%. You can elect MP Rotators when installing a new system, and they can easily be retro-fitted to an existing system. The key is the unique multiple rotating streams that deliver water with a steady, slower application. This allows water to gently seep into the soil with even distribution and prevents pockets of overwatering often found with single spray stream nozzles. Rather than simply spraying water onto landscapes, the MP Rotator delivers streams of water at a slower rate that soils can absorb, significantly reducing runoff. 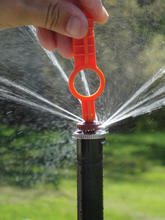 This high-efficiency nozzle can achieve a radius of up to 35 feet and an arc from 45-360 degrees. Contact us today to discuss enhancing the performance and efficiency of your current system by switching to the MP Rotator nozzle. Looking for a new system installation or renovation? Contact us for a free estimate and indicate your preference for the MP Rotator. You’ll be glad you did!